Those who need serious power for their custom car audio system will want to invest in the best 5 channel amp. The benefit of a 5 channel amplifier setup is that it can power all four speakers and a subwoofer with its own dedicated channel. It is a good idea to run this system if you want to have one speaker for each corner of the vehicle as well as a powerful subwoofer in the back. Another benefit of the best 5 channel car amp setup over a 4-channel is that the subwoofer(s) can get plenty of power without having to bridge the connection. 2 What Are The Best 5 Channel Amp Reviews 2019? What Are The Best 5 Channel Amp Reviews 2019? Although a relative newcomer to the car audio market, Rockville has quickly made a name for itself as one of the premier American sound equipment companies. Rockville’s latest 5-channel car amplifier, the dB55, looks to make its mark by proving it is in keeping with the quality standard set by Alpine, Rockford Fosgate, and the other big-name brands. In our view, the specifications on this amp model far exceed what you would expect based on its unassuming price tag. This is especially true when you consider that the peak output level of this amp can reach as high as 480W at 2 ohms with an additional 2,000W for the subwoofer. At 4 ohms, this amp peaks at an astonishing 320W per channel with 1,200W for the subwoofer. With a MOSFET power supply, you rest assured knowing that the circuit board is well-designed and will enter protection mode before it short circuits. Since it has an optical coupler, the amp can switch between Class-D and A/B class technology depending on the performance demands. Bass lovers will rejoice with the dB55 because it comes with a fully adjustable 12dB bass equalizer. With this feature, you can adjust the bass levels to suit your preferences without having to worry about distortion. 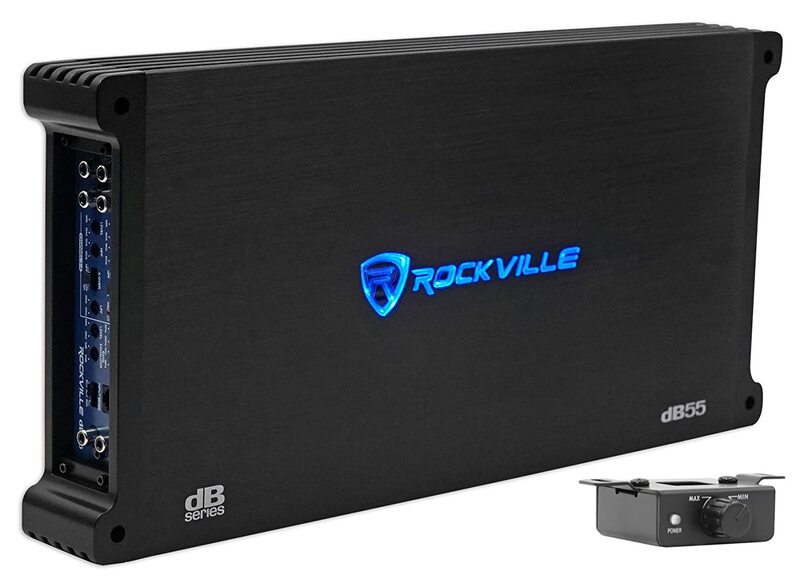 If you like your music loud, the Rockville dB55 will make an excellent choice for your car audio system. When we installed it in our vehicle, we found that it provided more than enough power to our rear and front loudspeakers even when we had it far below its maximum output settings. Although this amp is heavier than most in its class (10.75 pounds), it has excellent performance to back it. If for whatever reason, you are unsatisfied with the output provided by this 5-channel amp, you benefit from peace of mind knowing that it has a 90-day hassle-free return policy. If this is your first time setting up a custom car audio system, you may find that the db55 has a relatively complicated installation process. This is mostly since the Allan key screws provided in the box sometimes do not fit the mounting equipment in some vehicles. However, a quick trip to your local hardware store can turn a daunting process into a simplistic one provided you pick up the right screws. For decades, the Alpine brand has become synonymous with high-performance vehicle audio. Today, this Japanese consumer electronics company still ranks among the best car audio providers on the market. However, since the car audio market has become more saturated with competitor brands in recent years, Alpine finds itself having to contend with many rivals. 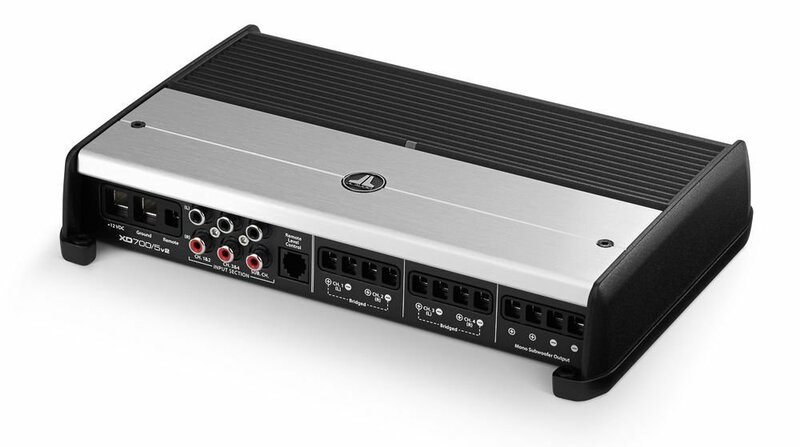 Luckily, the Alpine PDX-V9 is one of the best 5 channel amp available today. Below we break down why the PDX-V9 is an excellent choice for audio enthusiasts in need of significant power and personalization. Built on Class-D technology, the PDX-V9 boasts a total peak power output of 1600W and a total RMS output of 800W at maximum settings. With this model, the maximum output gauge size is 4 AWG and the total harmonic distortion is an impression .01%, which makes for clean, undistorted audio. If you are a fan of bumping bass, you will be glad to know that there is a bass boost of up to 12 dB available with the PDX-V9. To adjust bass levels, users can use an optional remote bass level control to toggle settings on Channel 5. Further, this model has an impressive high and low-pass crossover frequency range between 30-600 Hz, which allows it to cover a wide variety of sound levels. 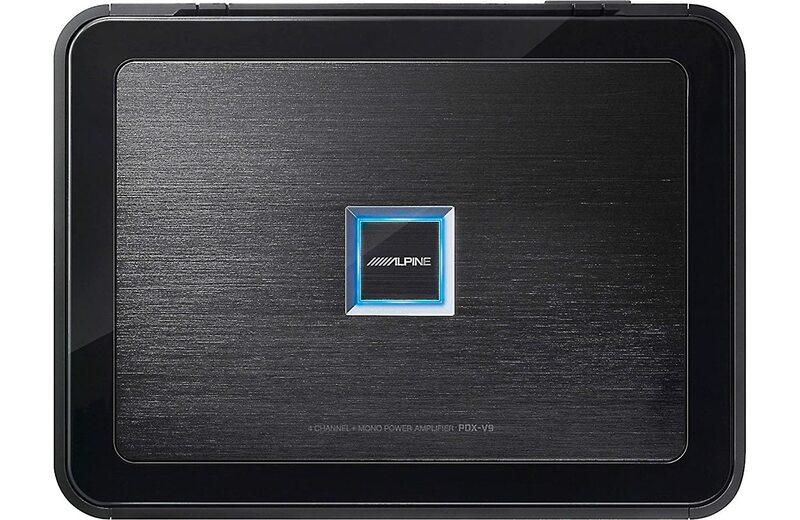 When testing the Alpine PDX-V9, we found that its performance was in line with Alpine’s track record of high-quality amplifiers. Not only did this amplifier produce crisp, clean sound through our four 10-inch speakers, but the harmonic distortion was as low as .004%. Consequently, the signal-to-noise ratio was right where you want it to be for a stellar car amplifier. With this amp, you get the best of both worlds regarding control and power. Not only is every channel capable of fine-tuning and adjustment, but the frequency response can reach as high as 100 kHz and enter sound ranges far beyond what humans can even detect. Unlike most 5-channel amps, the PDX-V9 involves a relatively simple installation process. At less than six pounds, it is light enough to be maneuvered into any car stereo terminal, and its five ports make it easy to snap connectors into. Since it can be stacked vertically, the chassis provides plenty of leeway at the top for another chassis to be installed above it. Since 1946, Japan’s Kenwood Corporation has been making waves in the car audio industry. However, in recent years they have faced stiff competition from new American and Chinese manufacturers that have taken up a greater portion of market share. 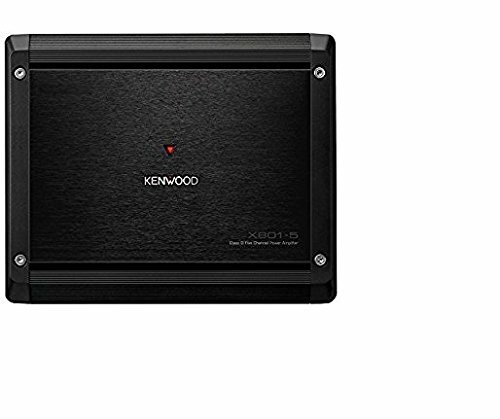 In response, Kenwood released the X Series of 5-channel car amplifiers to help re-solidify their standing. The Kenwood Excelon X801 is the most recent flagship device in the X Series of 5-channel car amps. At a mid-range price point, it competes with the high-performance equipment produced by Rockford Fosgate and Alpine. Find out how it compares below. Better yet, the X801 is CEA-2006 compliant which indicates top-notch circuitry and energy efficiency. This model has a variable low-pass filter on the subwoofer channel of 50-200 Hz at 24 dB and a separate high-pass filter for the speakers at 50-200 Hz at 12 dB. For added bass, you can bump up the sub channel up by 18 dB at 40 Hz to provide car-rattling performance. If you are risk-averse, you will be glad to find out that this amp is covered by a comprehensive 2-Year Manufacturer’s Warranty. The Excelon X801 is more than capable of supplying our two sets of 10-inch speakers in the front and rear of the car as well as a 10-inch Alpine subwoofer in the trunk. With a total power output of 1600W, you never have to worry about settling for less than your speakers or sub’s maximum potential. Plus, the low harmonic distortion rating (<1.0%) makes for clean, clear sound every time you boot it up. With plug-and-play functionality, setting up this amplifier is a breeze compared to some of the cheaper models on the market. Although the wiring and hardware are not included in the box, mounting kits are highly affordable and available online, and we recommend using 4-gauge power wires and grounding the power supply. Although known for its music and guitar equipment and accessories, Japan’s Boss Audio has quickly emerged as a major player in the car audio industry. The latest addition to its lineup, the PV3700, is a budget-friendly solution for powering your audio system at a fraction of the cost of its competitors. If you are looking for the best 5 channel amplifier for price-to-performance ratio, this is the model for you. 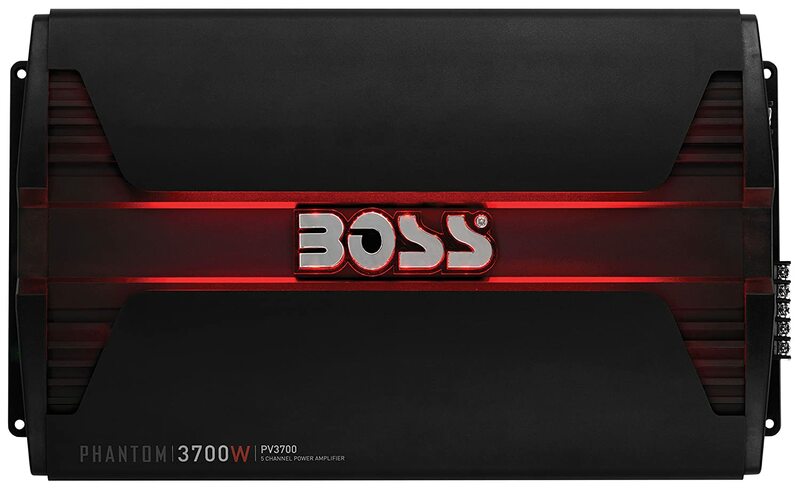 At a low price, this wonderfully-designed, and LED backlit amplifier can provide the same degree of performance offered by units nearly twice its cost. Plus, a MOSFET power supply provides added peace of mind since it protects against shorts and overloads. A remote control for the subwoofer enables bass customization and fine-tuning if you like your bass at a higher or lower level. Also, variable low and high-pass crossover functionality makes sure your sound is evenly distributed across all five channels. The PV3700 packs stellar performance despite its lightweight form factor and modest price. During our test run, we found that there was minimal clipping and cut-outs at the maximum output when running it through our 12-inch subwoofer and four Alpine speakers. With the PV3700, setup is relatively straightforward. All of the mounting equipment comes standard in the box, and the user’s manual provides end-to-end instructions for bracketing it to your car chassis and stabilizing it properly. The metallic connectors and ground leads make it easy to fix four or eight-gauge power wires for optimal performance. The JL Audio XD700 is the latest addition to the American consumer audio manufacturer’s lineup of 5-channel premium-grade car audio amplifiers. Variable high and low-pass filters allow for up to 500 Hz at 12 dB per octave, which is more than enough range to maintain clear, well-balanced sound quality regardless of your speaker system. Plus, patented NextD switching technology makes for even better balancing than most competitor models. One of the best performance features of the XD700 is the excellent cast alloy heatsink and thermal cooling system that keeps it running at a stable temperature regardless of external conditions. Even during the hot weather, we were able to run this amp at a cool 79 degrees when playing bass-heavy music at high settings. We recommend using a 4-gauge power wire setup and using the ground leads provided in the box with a 60-amp fuse. However, this hardware must be bought separately. Regardless, the mounting bracket for this model is among the best 5 channel amplifier kits in its performance category, making end-to-end installation possible in 30 minutes or less. We’ve come to the conclusion of this article. We hope our guide has helped you choose the best 5 channel amp for your car’s speakers. Do check our guide on high-quality car amplifiers , as well as the best 4 channel amp on the market. I bought the boss and installed in a Toyota aristo 1999. Similar to Lexus gs300. replaced stock 10 sub with kicker 10c104 rear 4-inches with kicker 4-inches and front with Alpine 6-inches and a Pioneer xh390bs. Very happy except the lack of easy vertical mounting. Its loud and I discount the power rating as over exaggerated but happy. Hey Ludwig, thanks for sharing your experience. Sounds like a nice setup, good job! We actually have a double-DIN review article coming out any day now. That Pioneer AVH-X390BS unit is a solid one. Enjoy the tunes, my friend.